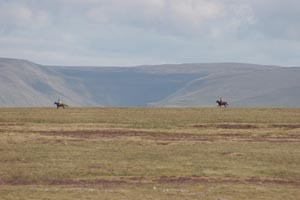 There just happened to be a local endurance ride this weekend near Seren Arabians - the Cumbria Challenge, and it just happened to be one of the most gorgeous locales one could imagine. Dom and Jan Atkinson took me on Sunday to the ride venue in a large green field overlooking a wide valley, and some terrically scenic points out on the trail. 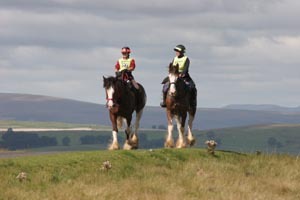 The ride was held over Saturday and Sunday, combining an 80 km Cumbria Challenge Endurance Ride, a 100 km Cumbria Cup Endurance Ride, various distances of Competitive Rides, and pleasure rides. Novice Competitive Rides run from 32 - 48 km (20 - 30 miles) to be completed between 8 - 12 km/h (5 - 7.5 mph). 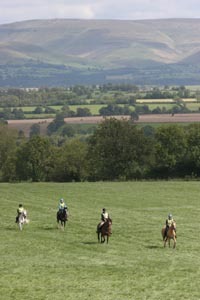 Penalties are given depending on the horse's final heart rate, and riding faster than 12 km/h means elimination at the Novice level. 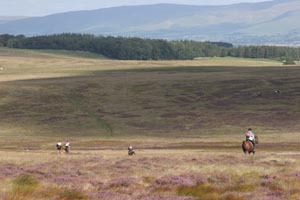 The speeds and distances increase until at Advanced Level you can compete in the Endurance rides, 80 - 160 km. Around 50 riders showed up on Sunday for all the distances and categories, and the last of the rain showers blew through right around start time, 8 AM, for the 80 and 100 km rides. It was mighty windy and chilly the rest of the day - and always with that gorgeous light that falls on the fells and valleys, the heather and green grass of Cumbria in northwest England. The trails followed mostly Bridle Paths or Bridleways - the old pack trails between villages, now legal rights of way and recreation trails for hikers, riders, and bikers. Many of these trails are bordered by drystone walls - some 70,000 miles of them are used as boundary fences, the use of which dates as far back as the Iron Age (1200 BC to 400 AD), and the earliest remains of which may date back to the Medieval period (5th to the 15th centuries). 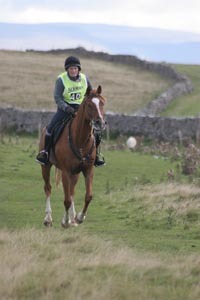 And you'll see a great variety of horses besides Arabians in the Cumbria rides. 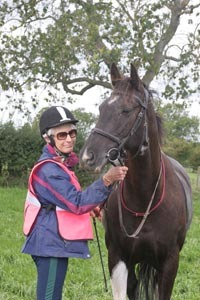 In the various sampling of riders I asked, I saw combinations of the Cob, appaloosa, pinto, clydesdale, shire, hanoverian, connemara pony, thoroughbred, and standardbred. The vetting procedures looked mostly the same as in the US; in the photos you'll see a couple of interesting horse vans - actual vans turned into horse boxes. A few people camped out in tents and some in their horse boxes, and the horses were all kept in electric pens in the field right next to the venue - though I'm not sure where any stallions were kept. I did see a barefoot trimmer, who said that people went wild here with Barefoot a while back, but then they didn't follow up on foot care, and they decided that barefoot didn't work. I did see several completely barefoot horses (no boots of any kind), and only one set of glue-ons. It looked like a fun day for all, and even the riders that I saw whose horses were pulled for lameness looked like they'd enjoyed themselves. And who wouldn't, in a setting like this!